The all new S 500 comes with a large 5-inch flat touch screen and the we have doubled the build in flash memory to 4GB which is expandable via SD card. 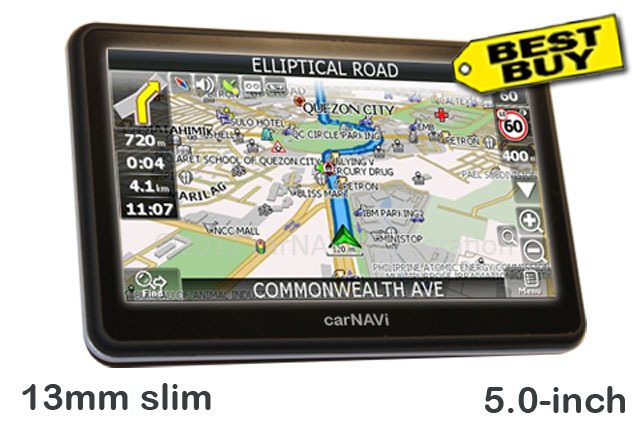 This stylish new navigation device is available now for a revolutionary price. carNAVi S 500 leads drivers with voice guided turn-by-turn directions in English or Tagalog to get them there, on time and safe. Preloaded with the latest high quality roadmaps covering the entire Philippines including thousands of points of interest (POI) with perfected localized routing and street name search, it’s compact, versatile and easy to use. 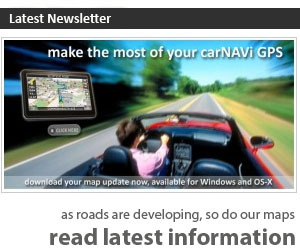 Additional maps of Singapore and Malaysia are preloaded, additional digital GPS maps for Indonesia, Vietnam, Taiwan, Hong Kong, Thailand and many other countries in Asia and cities worldwide are available in the carNAVi Store online free of charge. The maps contain detailed 3D view including elevated flyover, multi-layer streets and buildings with smooth map updates. Whenever a re-routing is necessary, the software calculates within seconds a new route or detour to the desired destination. carNAVi devices are able to route from island to island, useful for Trans-Philippine highway driving! Preloaded Speedlimit and Road Alert warnings inform the driver in the case of driving to fast or warn affront bumpy railroads or sharp curves. carNAVi S 500 has an unique ultra slim design (only 13mm) with a large 5-inch non glare widescreen display. Outside the car its rechargeable lithium-polymer battery makes it convenient for mobile navigation on foot with up to 5 hours’ usage between charges. 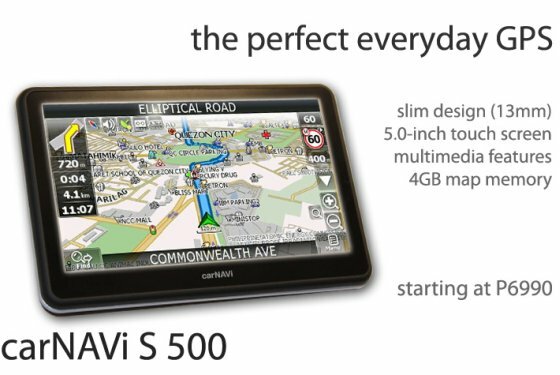 Powered by the latest SiRF Atlas V DUAL CORE GPS processor with 128MB RAM and 4GB build in memory for navigation maps, carNAVi S 500 is faster than most other GPS receiver and Galileo ready, future compatible to the new navigation standard. All GPS Navigation units will come ‘ready to run out of the box’. Accessories like a windshield mounting bracket and a car power-adaptor are included.